then it hasn't been the "swan song" for the selfie. 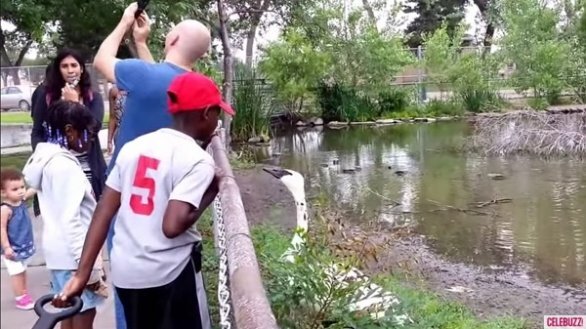 Stephen Takata was fortunate enough to have been filming when his brother-in-law Jeff decided to take a selfie with a large trumpeter swan at the zoo in Great Bend, Kansas. Jeff's plan went somewhat awry when the huge bird took offense at being photographed without permission. 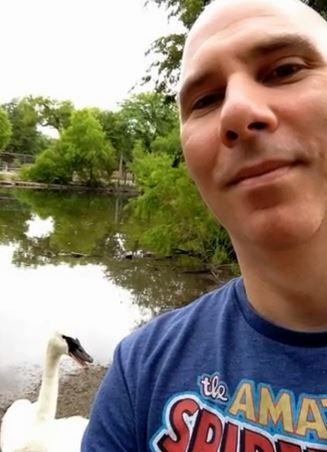 The swan reached out and tried to take a bite outta Jeff. Enter you own in-law joke here. If you were in the crowd that day and said, "That's gonna leave a mark." then you'd have been right. Jeff ended up with one big red mark on his back. Perhaps it was really just a nice swan hickey, but I don't think that was a kiss unless it was meant to be the kiss of death. For Takata it was worth his own 15 minutes of fame as his video went viral for a short time last month. For the swan it was probably a story it could tell its grand-cygnets about. Say what you will about brother-in-laws, at least Jeff managed to follow through and get the selfie despite suffering hilarious bodily harm. However, he had reportedly been trying to take the photo for a friend who had been attacked by one of the swans to prove that they weren't all that bad. So much for that part of the idea!